Dr. Paul Farmer examines a tuberculosis patient in Monrovia, Liberia. This week, world leaders are starting to give Farmer what he's been hoping for. On Wednesday, the United Nations General Assembly hosted the first-ever high level meeting focused exclusively on tuberculosis. World leaders pledged an ambitious goal: to try and nearly wipe out the disease by 2030. A cure for TB has been widely available since the 1950s. And yet TB is still the deadliest infectious disease on earth. It kills about 1.5 million people each year, or 4,000 people each day, including 600 children. It kills more people than HIV or car accidents. "Enough is enough. It's time to end TB," the World Health Organization's Dr. Tedros Adhanom Ghebreyesus told the U.N. General Assembly. One of the big obstacles is that TB strikes the poorest people in the world, who can't afford — or don't have access — to medications, Dr. Tedros said. In response, world leaders committed Wednesday to treating 40 million people in the next five years. By comparison, only about 54 million people were successfully treated since 2000. Each year about, there are about 10 million new infections. So the goal is to treat about 80 percent of the new cases. They also pledged to provide preventive treatments to 30 million people who are at risk of catching TB from a friend or family member. The overall goal is to reduce TB deaths by 90 percent by 2030. "These are bold promises," Tedros said. In global health, goals are often lofty but aren't easy to reach. So could a big meeting like this — big promises like these actually make a dent in the fight against a disease that's been neglected for decades. The medical nonprofit Doctors Without Borders (MSF) is skeptical, given how few leaders showed up at the historic meeting. "Out of the 193 U.N. member states, fewer than 30 leaders chose to attend the meeting today," Sharonann Lynch, who advises MSF on TB and HIV, wrote in a press statement. "Leaders missing from this critical meeting include many from high-burden TB countries and donors that have been promising to help fund the fight to 'end TB.' Shame on the more than 160 leaders who were absent today." But Dr. Paul Farmer is more optimistic. He is hopeful the meeting could be a turning point in the global fight against TB. "I have been a skeptic about the relevance of yet another meeting about a problem that really hasn't been addressed ever," Farmer says. "I felt that way about a similar meeting focused on AIDS, but then that meeting ended up being radically life-altering." That meeting, held back in 2001, ended up spurring the launch of one of the most successful anti-HIV programs ever — the U.S. program PEPFAR, the President's Emergency Plan For AIDS Relief. At the same time, the meeting spurred a surge in money for HIV treatment and research. Farmer is hopeful that this year's UNGA meeting may have similar effect on the fight against TB because, right now, he spends a huge amount of his time doing one thing: Begging. "Begging for money, begging for social support for patients," Farmer says. "[Treating people for TB] involves a lot of begging." Currently, the funding for TB treatment and research falls short each year by about $5 billion, said the president of the UNGA, Maria Fernanda Espinosa Garcés, on Wednesday. Farmer regularly sees patients falling through this funding gap. "I just got back from eastern Sierra Leone — the same part of Sierra Leone where diamonds come from — blood diamonds," he explains. "I saw a patient who was 33 years old and had a very confusing illness. It was clearly killing him." His name is Moses, and eventually Farmer figured out that TB was killing him. But treating him wasn't easy. The hospital was struggling to acquire the drugs and resources Moses needed. "He needs nutritional support. He needs physical therapy. He needs lots of medications," Farmer says. "If I could, I would part all the Red Seas in the world so that a young person like Moses could live a healthy life and not have it be over at 33- or 34-years-old. 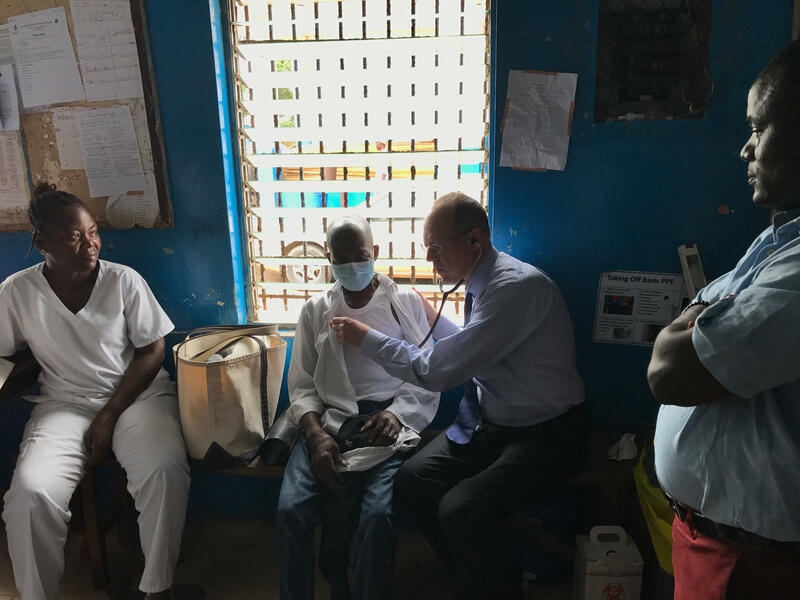 "It shouldn't be that hard for my colleagues in Sierra Leone to find the resources necessary to diagnose a young man like that and bring him to cure," Farmer adds. In a few years, maybe it won't be as hard, if leaders of the world keep their promise — and their commitment to imagine a world without TB.